Our professional speakers and consultants are inspiring coaches and trainers, practical visionaries, and successful problem-solvers. All of them are veteran educators with track records in helping schools succeed: students, teachers, administrators and paraprofessionals alike. Since 2003, we have provided staff development workshops, consulting, keynotes, residencies and institutes for general and special education teachers, administrators and paraprofessionals, preK-12, in their schools, districts, collaboratives, and at their professional conferences. To find out more about how Cristia Lesher Associates can help you, please contact us! Wonder if a Kid is NOT SORRY? 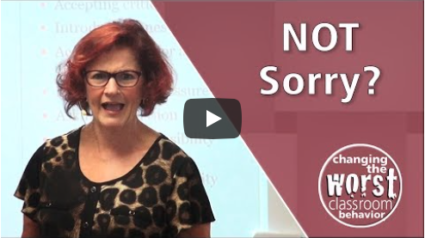 If a student isn’t sincerely sorry, could it be that we need to teach empathy for them to understand?